Congratulations to Helen & Nigel Ovens from Mearns T McCaskie who lifted the double at the Golden Haggis Awards. 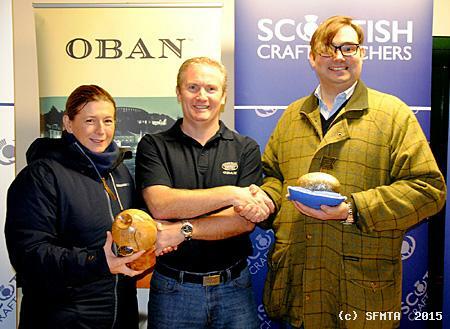 Nigel Ovens, of Mearns T McCaskie butchers in Wemyss Bay, won the Golden Haggis Award and the People’s Choice Award during the celebration of Scotland’s national dish at Oban Distillery on Sunday 29th November. 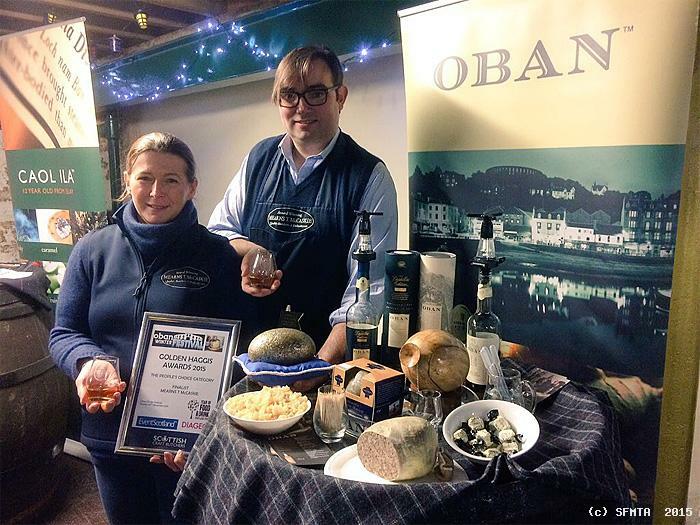 This year’s competition – which is part of the Oban Winter Festival programme – attracted nine competitors from across Scotland, whereas last year’s event was confined to local butchers. Nigel Ovens, who runs his butcher shop with wife, Helen, was crowned ‘Scottish Haggis Champion’ in May after beating more than 100 other competitors to the title. The 38-year-old said he was “absolutely delighted” to add another two trophies to his shop counter. The haggis he offers contains lamb’s offal, Scottish oatmeal, and a secret blend of pepper, salt and various spices. He added: “The judges look at the colour and smell of the uncooked haggis, then when it is cooked they look at how the flavour carries and how the spices work. The balance of offal and spice is important, and judges will look at how moist it is and whether or not it is too stodgy. “Although nine entries does not sound like a lot, it is important to say that this competition had a lot of quality. All of these butchers have won awards for their haggis. The Haggis Fest ran alongside whisky tasting and there were two contests. One, the Golden Haggis Award was judged by local experts - chef Alex Needham and craft butcher Alister Jackson. The other was for the People's Choice where all those attending got to taste and vote for their favourite. In the end there was to be only one winner with the attendees voting the same way as the experts. "It was interesting tasting them all and the one thing I would say about them is that it is all down to seasoning. There some quite lacking but two that were spot on. Both had a wee peppery kick at the end but we both quite liked that. "It was so close that in the end it was down to the look of the haggis." Nigel Ovens has been making haggis for 20 years and is the third generation of the family butchers, which has been running since 1935. At the popular competition held in the Cask Room of the distillery, members of the public were able to sample and vote for haggis made by all the competitors throughout the day. The haggis festival was held on the last day of Oban’s 10-day winter festival and was run alongside a whisky tasting experience. The festival closed with a Kelpie lantern parade and it is hoped to further develop Haggisfest into an even bigger event in subsequent years. Above: Joe Callaghan (left) of Callaghans of Helensburgh and Mark Grant (right) of Grants of Taynuilt with Les Aitken, Oban Distillery manager. A big thank you to Pamela and her organisers and a big thank you to all the haggis makers who took the time and trouble to enter.